Happy New Year from The Global Mosaic Project! We had an incredible year of projects and partnerships and are looking forward to 2015! We thank you for your support and look forward to seeing you somewhere the world! education to communities across the globe. Support our programs with a tax-deductible donation today! Immerse yourself in an educational trip and tour that will leave you inspired and creatively invigorated for the rest of the year! Join professional mosaic artists and educators Laurel True and Valerie Nicoladze at Valerie's Esprit Mosaique Studio in Avignon, France to explore and celebrate color and creativity through mosaics. Laurel and Valerie are teaming up for the second year in a row to offer a very special, specifically curated and inspiring trip that will combine hands-on studio time, a community project at a local social center, incredible insider sightseeing and experiential learning and amazing food...and wine...and cheese...and shopping in Provincial villages...and more. background treatment, demonstration of the uses of stacked and layered substrates and precision cutting and setting techniques for glass and ceramic. Each student will work according to their experience level. All level of students are welcome. Esprit Mosaique Studio offers a huge array of beautiful materials for students to use in the creation of their mosaic pieces. Drawers and drawers full of colorful and exotic materials from all over the world. Participants will have the opportunity to work with french materials that are not often seen or used in the US. Students will enjoy a guided exploration of materials and color through the creation of a piece that they will take home. One day of the week will include the creation of mosaics elements to be installed at Orel Social Center in Avignon. We will combine the elements we make with elements made by mosaic students trained by Valerie from the social center, creating a group mosaic project to be installed at the social center. We will spend an evening meeting our co-creators and enjoy a delicious couscous dinner together. In addition to enjoying time in the studio, participants will have the chance to eat delicious meals together, stay in a cute Provincial hotel, tour Avignon and nearby markets including St. Remy and Les Baux de Provence (a medieval village with an incredible view and violet gellato), visit the breathtaking and indescribable exhibition at Les Carrieres des Lumieres, as well as enjoy educational wine tastings and a Provincial backyard BBQ at the home of Valerie and her family. We will end our time together with a picnic in a lavender field and visit to the Village of Salut, where quaint shops offer all things lavender. Our trip in 2013 was an indescribable experience for everyone. We can’t wait to offer this trip again this summer! Cost does not include flight, dinners (except Tuesday and Thursday) and personal expenses. 50% due at time of registration to hold spot. We have only 10 spaces and expect this workshop/ tour to fill very quickly. Design and project facilitation by Laurel True. Mosaic murals created during Facilitating Community Mosaic Projects professional development training workshop at True Mosaics Studio. Mosaic created by Laurel True and students: Susan Buchan, Mamea Bolton, Robin Cannon, Miriam Denis-Harper, Krysia Haag, Maria Ludwig, Vicky Murphy, Karen O'Brien, Jennifer Neff, Mary Wilson and Marcia Yapp. Installation assistance by Randy Sanders and Frankie Muller. Materials were donated by The Green Project, True Mosaics Studio and local residents. The Green Project sells recycled building materials and paint. Their mission is to "develop a culture of creative reuse by building a marketplace for reclaimed materials and cultivating a respect for their value." In addition to enjoying time in the studio, participants will have the chance to eat delicious meals together, tour nearby Provincial markets including St. Remy and Les Baux de Provence, visit the breathtaking and indescribable exhibition at Les Carrieres des Lumieres, as well as enjoy educational wine tastings and a Provincial backyard BBQ at the home of Valerie and her family. (Sunday the 23 - Friday the 28th), breakfast and lunches, Thursday night special dinner, transportation from train station or Avignon airport and to and from workshop, and all touristic visits to markets, exhibits and wine tastings. Evening: Winery visit and wine tasting at Chateau Neuf du Pape, then a slow food, Provincial family bbq at Valerie’s beautiful home. Hotel de Atelier is a charming hotel in the lively village of Villeneuve Las Avignon, five minutes from the town of Avignon. "Valerie hosted me at her beautiful home and studio in Provence last Spring and we decided to put together this workshop experience so that mosaic artists could come and enjoy the atmosphere of this amazing area and the warmth and hospitality of Valerie and her family and community. I came back from that trip bursting with energy, inspiration and a full heart, and can't wait to share this experience with my students!" " I welcome you to my studio and town, in the hopes that each participant/ student comes away with a feeling of having spent a wonderful week of creativity, sharing our mosaic passion and fun, discovering the most beautiful places in Provence, with the desire to come back to explore more ! Students may also make one payment if they wish, at time of registration. Cancellations after April 15th are non-refundable, unless space is filled and in that case there will be a refund minus a $100 admin fee. Pastis and absenthe... super French. Artist and educator Laurel True will be presenting a day-long seminar at the Society of American Mosaic Artists Conference, the American Mosaic Summit, in Tacoma/ Seattle this April. This seminar will be of particular benefit to mosaic artists who would like to add a community component to their work, teachers, community organizers and anyone interested in community development and entrepreneurial training through the arts. This seminar is part of conference programming and is open only to conference attendees. There are still spaces left in this information packed, professional development workshop. This seminar-style workshop will focus on methodology and techniques for approaching community-based mosaic projects with participants of all ages and skill levels. Students will come away from this information-packed workshop with the knowledge, skills and confidence to lead and facilitate successful, permanent projects that engage and inspire community. Workshop will begin with a presentation of successful project models and lecture will include sample pedagogy for including and training community members in the creation of public art. Instructor will cover various approaches to community outreach, design development, sourcing locations and materials and recruiting project participants. Lecture will include step-by-step instructions with complementary images describing multiple approaches to project coordination, management and creation with a focus on creating permanent artworks specific to host communities; needs, desires and location. 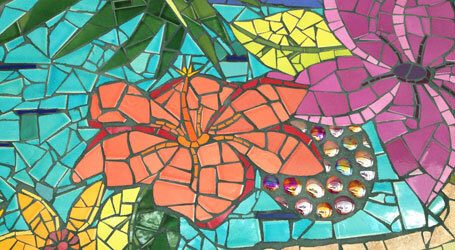 Instructor will present mosaic-making approaches and techniques that can be employed with groups with any level of training. Class will focus on best practices for technical construction methods so that projects are durable, safe and long lasting. Technical resources will be included in extensive class binder. The Global Mosaic Project: A Look at Our 2012 Projects! Since the inception of the Global Mosaic Project, we have accomplished so much! At the end of 2011, Laurel True formed the Global Mosaic Project, an organization that grew out of more than 20 years of creating and facilitating community-based and public projects through her company, True Mosaics Studio. "Global Mosaic Projects have positively impacted many communities this past year, from Seattle to Central Haiti. In the past 14 months, projects and trainings have directly served almost 750 participants of all ages and helped bring dozens of public art pieces to local and international communities. These projects have impacted economic development, offered art education and provided participants with opportunities for cross-cultural collaboration, creative exploration, team building, and collective healing." Please enjoy a visual recap of some of our recent projects and stay tuned for updates about our 2013 projects! All project designs by Laurel True, except where noted. Designs based on drawings by schoolchildren from Ecole de Choix in Mirebalais and Sunnyside School, Los Angeles, CA. Thank you to art teachers Blondel Joseph and Lois Keller for facilitating drawing sessions. Bird and Butterfly Artists participated in a community-based fundraising effort to support the Mosaic Artwork Fund. Thanks to all Artists and those who sponsored them! Boats, birds and animal designs were based on children's drawings. Paintings inside giant flowers by Harold St. Louis, wall backgrounds by Tony Nozero. Over 40 artists participated in a Make A Star For Haiti Fundraiser, hosted by Seattle Mosaic Arts, by making stars and comets or sponsoring artists. Thank you so much to SMA and Star/ Comet Artists and Donors! Designs for this mural were based on drawings by students from Dalton School. Mural done in Facilitating Community Mosaic Projects Professional Development Workshop at Norma Yuskos Studio in Encinatas, CA for Sunnyside School. 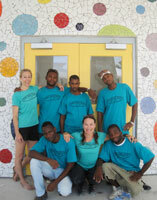 The Mirebalais Mosaic Collective's first project after Mirebalais Hospital! We can't wait to do more projects in 2013! For more information, please visit GlobalMosaicProject.org and be sure to check out our Facebook page! SIGN UP FOR OUR MAILING LIST to receive occasional updates on projects, classes, events and other news from The Global Mosaic Project and True Mosaics Studio. 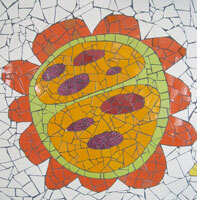 Spend an inspiring weekend with mosaic artist Laurel True learning the art of mosaic making. Workshop will meet in the studio classroom of El Saieh Gallery in Port au Prince, one of Haiti’s most respected contemporary art galleries. Beginning students and experienced artists wanting to expand their repertoire will learn techniques used for the creation of functional and decorative mosaics using ceramic tile and glass. Experience why one of the oldest art forms in the world has so much appeal today. 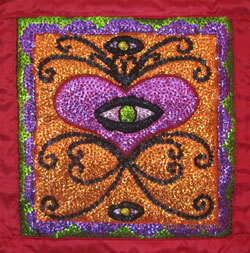 Class will begin with a presentation of images of contemporary mosaic work from around the world. Instructor will introduce and demonstrate the various tools and techniques used in mosaic making, and discuss the use of adhesives, surfaces and materials for different applications. Students will learn how to cut and shape tile, and how to arrange pieces to get different effects. Class will cover both the technical and aesthetic aspects of mosaic making, while offering a great community experience in a creative environment. Students will be provided with a base to mosaic and have lots of great materials to choose from. El Saieh Gallery will provide a delicious vegetarian lunch on the veranda with beautiful views of Port au Prince. Workshop fee: $150, materials and lunch included. Laurel True is based in New Orleans and Haiti and has maintained a professional studio practice in architectural, public and fine art mosaics for over 20 years through her company, True Mosaics Studio. Her vibrant mosaics can be found in hospitals, parks, hotels, restaurants and in commercial and residential settings around the world. I am really excited to announce this Global Mosaic Project Tour to Haiti! Looking forward to getting a great group together to experience Haiti through a cross-cultural community project. We have added an additional July date for this trip! Join mosaic artist Laurel True and youth from Art Creation Foundation For Children in Jacmel, Haiti for an amazing mosaic-making adventure! 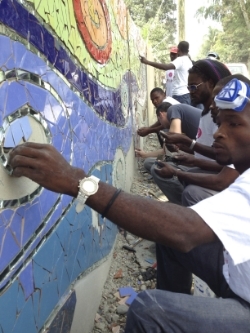 Be part of a group of international mosaic artists participating in global outreach and voluntourism on this unique trip, which will combine community mosaic mural making, sightseeing in one of Haiti’s most beautiful regions and visits to local art centers, schools and beaches. Jacmel is known for its laid-back atmosphere, beautiful beaches and abundance of artists and musicians. The architecture is reminiscent of New Orleans. Jacmeliens are friendly, welcoming and motivated to rebound after the devastating earthquake. This trip is appropriate for mosaic artists and novice artists alike. 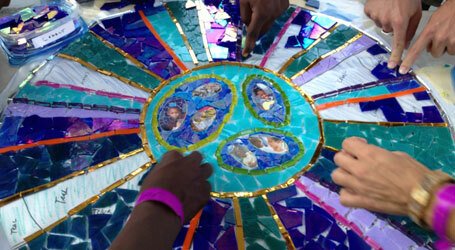 Seasoned mosaic artists will benefit from professional development training in community mosaic project facilitation and novice mosaic artists will receive hands-on training, while participating with other community members learning about mosaics. After our arrival in Port au Prince, we will visit a famous art gallery founded by musician Issa El Saieh, and enjoy lunch at at the historic Hotel Oloffson. We then travel northeast to visit Mirebalais, where Laurel and a team of Haitian mosaic artists have created multiple projects in the new Mirebalais Hospital being built by Parters In Health. We will return to Port au Prince for our first evening together in Haiti. The following day, we travel southeast to Jacmel. Our days will include working on the mosaic mural, and relaxing in the evenings at a stunning waterfront hotel, Cap Lamondu. Laurel will offer several professional development sessions in the evenings, including a debrief on the day, and deliver clear information on best practices for mosaic creation and project facilitation. An afternoon will be set aside to relax on one of Jacmel's beautiful beachs, and enjoy tropical juices or rum drinks. Our last evening in Jacmel will include a project dedication and evening of traditional Haitian music. Wait til you see how beautiful Haiti is. $1,795 based on double occupancy in a fine hotel in Port au Prince and Jacmel, Haitian-English speaking tour guide, lux ground transportation, delicious Haitian meals/day. **Price does not include your US to Haiti airfare. ***Please note that $200 will be tax deductible, and a direct contribution to Art Creation Foundation For Children. View on the drive to Jacmel! 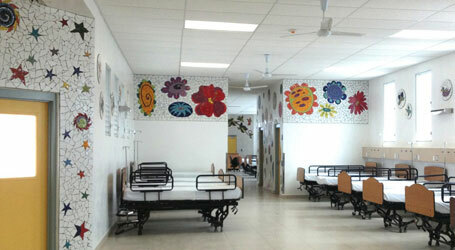 Painted mural by ACFFC youth (below). Mosaic artist and project participant Erin Rogers working with ACFFC youth. Laurel True in front of mosaic mural at Mirebalais Hospital. Completed by True and her team in 2011. Laurel True is based in New Orleans has maintained a professional studio practice in architectural, public and fine art mosaics for over 20 years through her company, True Mosaics Studio. Her vibrant mosaics can be found in hospitals, parks, hotels, and in public, commercial and residential settings worldwide. Laurel teaches and lectures internationally and facilitates community-based mosaic projects through her organization the Global Mosaic Project. Laurel began working in Haiti in 2010, with Art Creation Foundation for Children, where she has an ongoing role as Lead Consultant for the Mosaique Jacmel Project. Laurel is the co-founder of the Institute of Mosaic Art in California and has been teaching mosaic techniques for over almost 20 years. For more information please visit www.TrueMosaics.com.